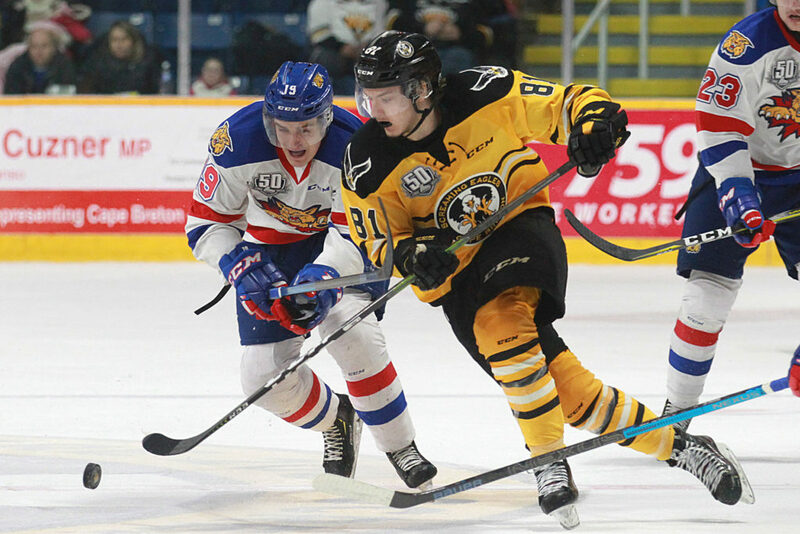 A stretch of seven games unbeaten came to an end for the Cape Breton Screaming Eagles in a 4-0 loss to the Moncton Wildcats Friday at Centre 200. Opportunities were tough to come by in the first twelve minutes of the game, as the Eagles outshot the Wildcats 5-1. Things would open for the visitors on the power play: with Olivier Bourret off for cross-checking, Kyle Havlena put the puck over the glass to give the Wildcats a 1:36 two man advantage. One minute into that power play, Jeremy McKenna finished a cross-crease pass from Jakob Pelletier to put the visitors on the board. The Eagles were able to kill off the balance of the Havlena penalty, but were not able to capitalize on their own power play to end the period. Moncton led 1-0 after 20 minutes. The second period would follow a similar script- with Moncton outscoring Cape Breton 1-0 on a special teams goal. However this time the goal would come short handed. The Eagles earned the only three power plays of the period, but it was a short handed marker with under three minutes to go that would double the Wildcat lead. Brady Pataki fed Mika Cyr a pass on a 2 on 1 and Cyr would rip it over the shoulder over Willam Grimard. 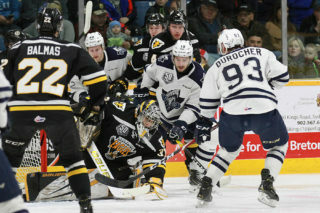 The home team would generate their best chances in the early portion of the third period but Francis Leclerc was able to turn the Eagles offence aside at every turn. A power play halfway through the third frame couldn’t break the Eagles scoring funk and Zachary Alchorn would come out of the penalty box, up the wing and put the puck through Grimard’s pads. 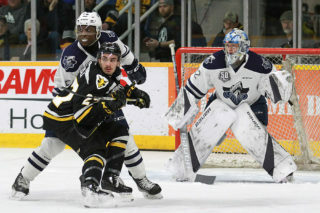 Down three goals, Screaming Eagles coach Marc-André Dumont elected to lift Grimard for an extra attacker with over eight minutes to play. The move did not pay off as Jacob Hudson hit the empty net to push the edge to 4-0, and there would be no further scoring. Leclerc picked up the win, stopping all 37 shots. Grimard stopped 16 of 19 shots in addition to the empty netter. 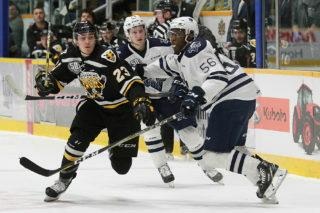 The Screaming Eagles finish off their homestand tomorrow with a showdown against their provincial rival Halifax Mooseheads, who are making their final visit of the season to Centre 200. The game will be part of Hockey Day In Canada celebrations in the CBRM, and 500 youth tickets (under 21) will be priced at $5 on a first come, first serve basis. In addition, a special popcorn and pop special for youth will be offered at the game. 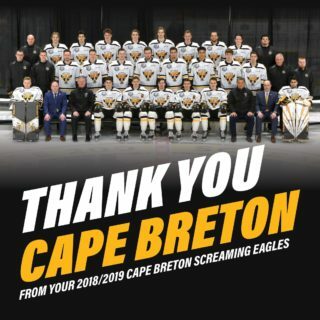 It will also be CBU Night at the Nest, as Cape Breton University will be presenting live music, activities, on ice presentations, and more for all in attendance. CBU and the CBRM encourage all spectators to wear orange as CBU’s “ORANGE ARMY” will be looking for Superfans during the game for giveaways. Tickets for the game can be purchased online at http://tickets.capebreton.ca or at the Centre 200 Box Office.